A pack of Wildcats celebrate a goal. 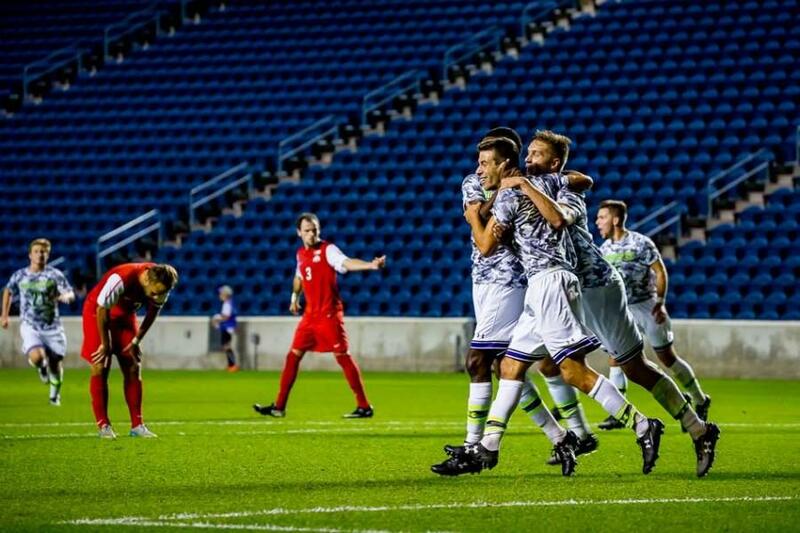 Northwestern needed late game heroics from sophomore forwards Sam Forsgren and Elo Ozumba to escape UIC with a 2-1 double overtime victory on Wednesday. With a return to Big Ten play looming on the horizon, Northwestern triumphed 2-1 in double overtime over the University of Illinois at Chicago (4-3-1, 1-0-0 Horizon League). The victory ended a three-game winning streak for the Flames and enabled the Wildcats to even their record for the year. Once again, NU (3-3-1, 1-1-0 Big Ten) found itself facing an early deficit, this time after conceding a header goal off a cross in the 30th minute from Flames back Thomas Villamil off a set piece. Coach Tim Lenahan said NU “battled all night … even after the first goal, they were all over us on set pieces all night.” Lenahan agreed with the assessment that the NU defense operated under something of a bend-but-don’t-break model tonight, which is “always nerve-wracking for coaches”. Going into the second half, NU began to press the Flames further up the field on defense. The Cats were able to level the score in the 65th minute on an impressive finish by senior back Henry Herrill. NU forced overtime because of this goal, as the remaining 34 minutes saw no scoring for either side. Nonetheless, the final 10 minutes in regulation saw two Flames headers turned away. The Cats were unable to capitalize on an 83rd minute header by senior forward Joey Calistri, and the final minutes winded down with a late yellow card for Flames back Kyle Hamann. The first half of overtime saw two shots from the Flames sail wide and high, respectively, while NU could only manage one shot from sophomore forward Sam Forsgen. The second overtime featured more scoring chances for both teams, but it appeared likely that momentum was with the Flames. After a 101st minute shot from Calistri, the Flames rattled off two shots in quick succession. The first shot was saved by Cats senior keeper Zak Allen. After a subsequent shot resulted in yet another Flames corner kick, it appeared that the Cats’ best hope was a draw. However, after successfully defending this final Flames’ corner, NU was able to bring the ball down the field and score off a pass from Forsgen to sophomore forward Elo Ozumba for his first goal of the season. “Johnny Moderwell made a diving header that sprung us, and then Sammy made a great pass to Elo,” Lenahan said. The shot into the back right corner of the net ended a very long night for the Cats on a successful note, one that they will look to carry forward into their upcoming match against Indiana on Sunday.